Backing up iPhone is of utmost importance. Putting aside its financial worth, your iPhone offers a repository for all great memories, whether photographs or important documents. Ensuring that this precious data is stored somewhere safe is a key safeguard against loss, theft, or accidental damage. Apple provides iOS software updates several times a year, and having a data backup before update to the latest iOS version, i.e. iOS 12 in this year, can save you a great deal, if something goes wrong. 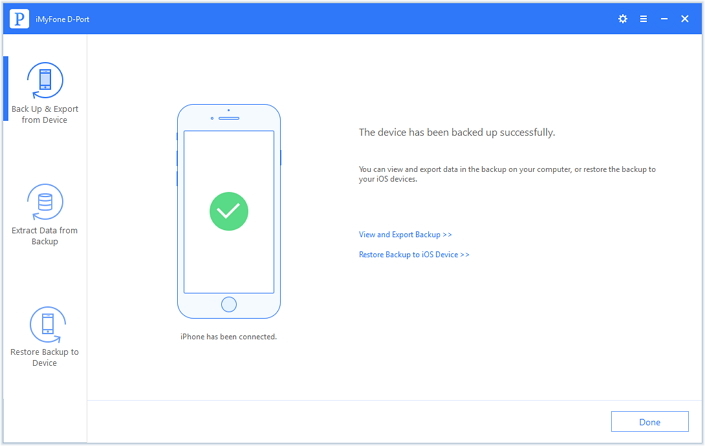 The most common way to backup iPhone data is to use Apple's iCloud service, i.e. to back up iPhone to Apple ID. If you are asking "How do I back up my iPhone to Apple ID", then you are in the right place. We will discuss how to do this and its pros and cons. 1. How to Back Up iPhone to Apple ID? On the next screen, tap iCloud Backup to turn on the service. Slightly below iCloud Backup, you should see Back Up Now. Tap it to start backing up your data. This process requires an internet connection. Thus, ensure you stay connected until the process is complete. How to Back Up iPhone to Apple ID Automatically? 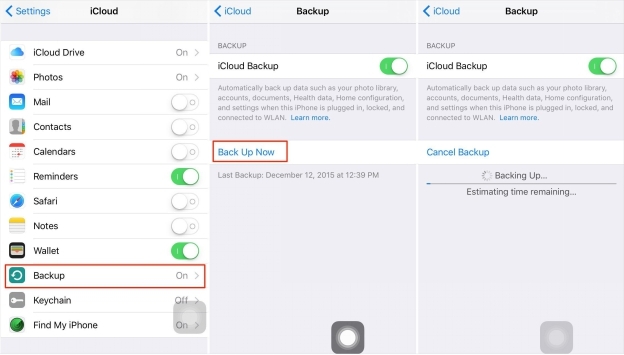 If you keep on forgetting to back up your iPhone manually, here is how to set it up so that it stores your data in iCloud without you having to do anything. Go to Settings and tap iCloud. On the next screen, tap iCloud Backup to turn it on. Then once you connect your iPhone to a power source, ensure it is connected to a Wi-Fi network, and lock its screen, the automatic data backup will begin. Furthermore, you have to make sure that you have enough space to store the backed up data. As earlier stated, Apple offers 5GB of iCloud storage space for free. However, you can purchase more of this - plans start at $0.99 for 50GB. Here are the advantages and disadvantages of using Apple ID to back up your iPhone data. Easy to Use: Backing up your iPhone with iCloud is quite easy and you can do it in just a few steps. Automatic Backup: Backup takes place at any time provided you satisfy the 3 requirements of automatic backup. Limited iCloud Free Space: There is a general feeling that Apple should offer more iCloud space for free. In addition, it seems unfair that they provide free space as per Apple ID, instead of increasing it when you purchase more devices. . Requires Internet Connection: To back up iPhone data to Apple ID, your device needs internet connection. Without this, backup is impossible. In security, we say that if you back up something once, then you have not backed it up at all. Having multiple copies of data is one of the best ways to guarantee that it will not get lost if disaster strikes. How to back up iPhone without the cons of iCloud backup? This is where iMyFone D-Port comes in. Why We Choose iMyFone D-Port to Back Up iPhone? Back up iPhone according to your need. You can back up all the data and settings, or back up just WhatsApp, messages, or WeChat if you would like to. Back up iPhone without overwriting previous backups in iTunes or iCloud, and totally for FREE. Extract over 20 types of data from backup files or iOS device to computer for more use. Its pro version can selectively restore data from iCloud and iTunes backups. How to Back Up iPhone via iMyFone D-Port? Launch iMyFone and connect your iPhone to your computer. From the left panel, select Back Up & Export from Device. Click Make a Full Backup. On the screen that appears, click Back Up to start the backup process. After the process is complete, you will be notified that your iPhone data has been backed up successfully. Later on, you can view and extract this backed up data or restore your device from it. As aforementioned, iMyFone can back up only WhatsApp, Messages, and WeChat also if you don't need a full backup. You can also back up contacts only if you are subscribed to the pro version of iMyFone D-Port. This can be done by similar steps. Furthermore, you do not have to back up data you do not need. To stay safe, you need to back up your data on a regular basis. Apple iCloud offers a great backup option but you ought to have extra responsibility to make sure your data is safe. iMyFone D-Port is a backup creator and extractor that offers better features, which allow you to backup iPhone data without the limitations of backing up iPhone to Apple ID. 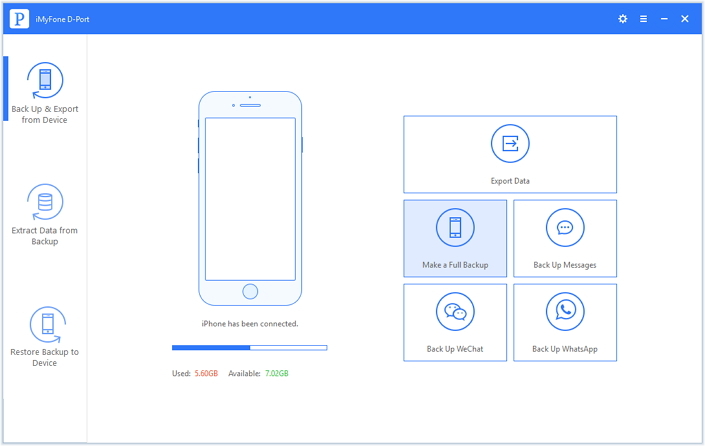 Download the free iPhone data backup tool now! Have the Annoying “This iPhone is Linked to an Apple ID” Problem? Fix It Now!